To edit a Business rule, you have to be an Account Owner or the rules have to be shared with you. To edit an active Business Rule-> go to your Administration panel at the top right side of your board interface. 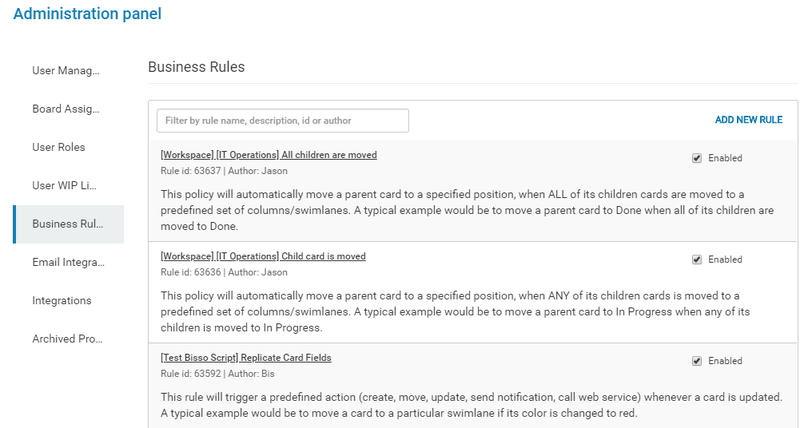 Open the Business Rules tab -> click either on the name of the existing rule or use the edit icon (the pencil) to the right side of the rule to access the configuration panel. Note: You can run a quick search for a business rule by typing a word in the Filter field. Insert your changes in the Configuration panel of the rule. Do not forget to click on the green checkmark to the right of the name to apply the changes. Use the the red x-sign to cancel it. *For a better view -> right click on the image to open it in a new tab.